This adorable, textured, babydoll-style dress is so much fun to wear! The dreamy-soft fabric is probably one of the comfiest things you'll ever put on. A high collar and oversize shoulder bow will put you right in high fashion this season! Wearing this modest dress is the next best thing to brunching on scones and coffee in Paris. Back zipper. Peach and Lime colors are made of a lovely, light, flowy polyester fabric, perfect for spring. Cherry color made with a thicker Jacquard Polyester. ALL SALES FINAL. Got my dress for a special youth conference and was in love!!!!!! Awesome quality and loved the color as well!!!! Got a ton of compliments on it, was definitely worth the purchase!!!!! I can't wait to wear this dress for our church anniversary. Such a lovely peach dress! 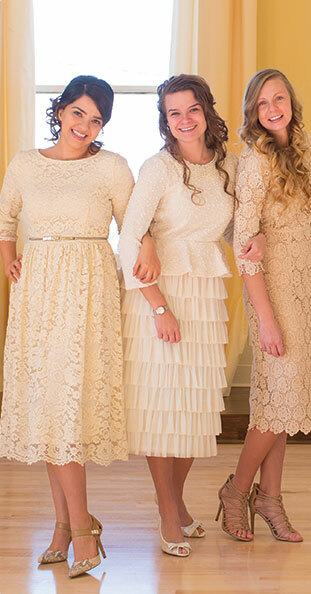 I bought this dress specifically for our Anniversary Service that is coming up in May. Can't wait to wear it!